KANOA IGARASHI DECIDES TO REPRESENT JAPAN ON ELITE WORLD SURF LEAGUE CHAMPIONSHIP TOUR, A FIRST. HE BECOMES the FIRST COMPETITOR TO FORMALLY REPRESENT JAPAN ON WSL! Kanoa Igarashi, 20, will represent Japan on the WSL Championship Tour. LOS ANGELES, California, USA (Monday, February 12, 2018) – Kanoa Igarashi, 20, will represent Japan heading into the 2018 World Surf League (WSL) Championship Tour (CT) season. 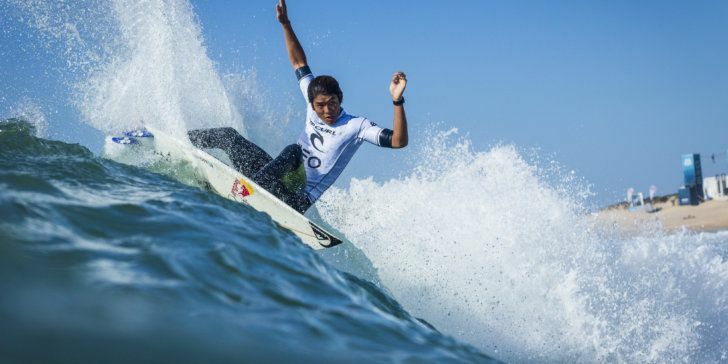 A dual citizen of Japan and the United States, Igarashi decided to change his representing country as he eyes the 2020 Olympic Games in Tokyo, which will include surfing for the first time. With this change, Igarashi becomes the first competitor to officially represent Japan on the WSL CT. In 2016, Igarashi joined the CT as its youngest member (then 17) and has proven to be a leader in the next generation of progressive surfers. Igarashi’s career has been decorated with impressive performances as he has ranked in the Top 20 for the past two years. His standout victories include first at the Vans US Open of Surfing in 2017 and a runner-up finish at the Billabong Pipe Masters in 2016. Igarashi will compete under Japan for the first time in the 2018 WSL Championship Tour kickoff event, the Quiksilver Pro Gold Coast, in Australia from March 11 – 22, 2018.